For Palestinians, Rajoub turns all of Israel into "Palestine"
Text on map: "Know Your Homeland - 2017"
"We in the Palestinian leadership are determined to seize this opportunity to achieve the long overdue two-state vision." 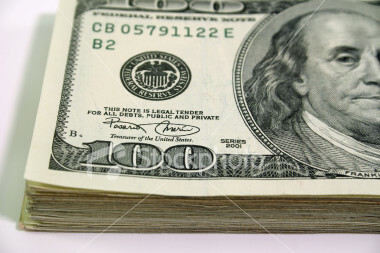 Later Rajoub wrote: "We will accept no solution but a two-state one." 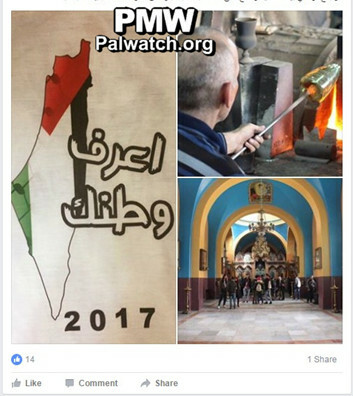 Palestinian Media Watch has documented that Rajoub was an active terror promoter and supporter during last year's Palestinian terror wave. 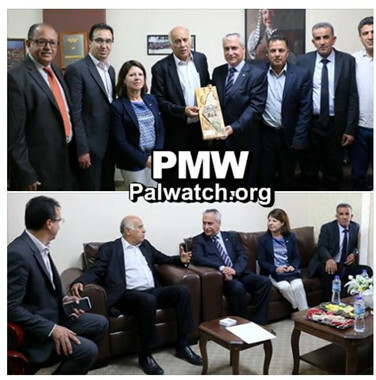 The documentation below shows that Rajoub's claim in Newsweek to be a supporter of the "two-state vision" is a very different message from the one he promotes to Palestinians. 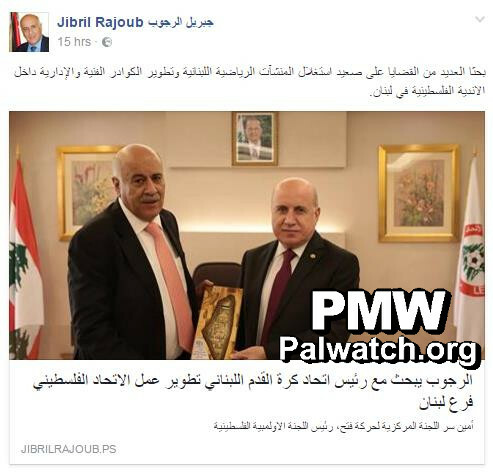 In numerous contexts, Rajoub has handed out plaques of honor decorated with the PA's map of "Palestine," which erases Israel's existence. Instead, all of the State of Israel is included in "Palestine" in addition to the PA areas. 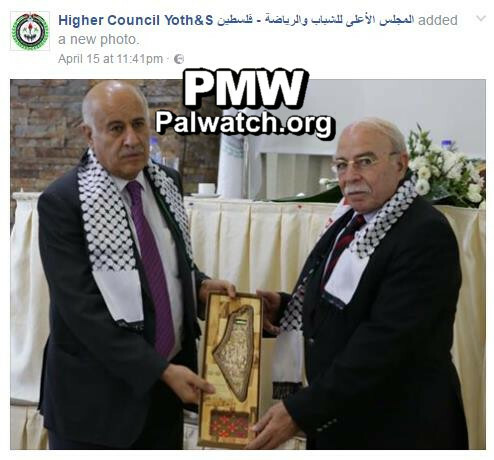 Jibril Rajoub heads the PLO's Supreme Council for Sport and Youth Affairs and when the council held a youth camp named "Know Your Homeland," it chose the PA map that includes all of Israel as the decoration for the camp shirts. To make sure that the participants do not see this as a historical map of the past, the map was painted in the colors of the PA flag, symbolizing future Palestinian political jurisdiction over the entire area. 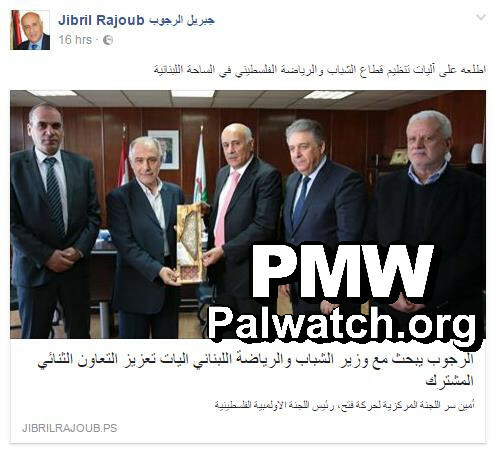 Rajoub's Higher Council posted a picture of the drawing of the PA map on its Facebook page. This message to Palestinian youth from Rajoub's organization is telling them that their "homeland" includes all of Israel and that they should expect to live in a world where all of Israel has become Palestine. 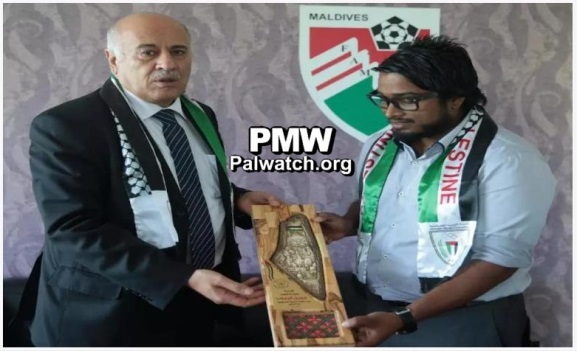 When Rajoub visited the "olympic village" at the Islamic Solidarity Games in Baku, he presented a Turkish representative with a plaque of honor in the shape of the PA map of "Palestine." 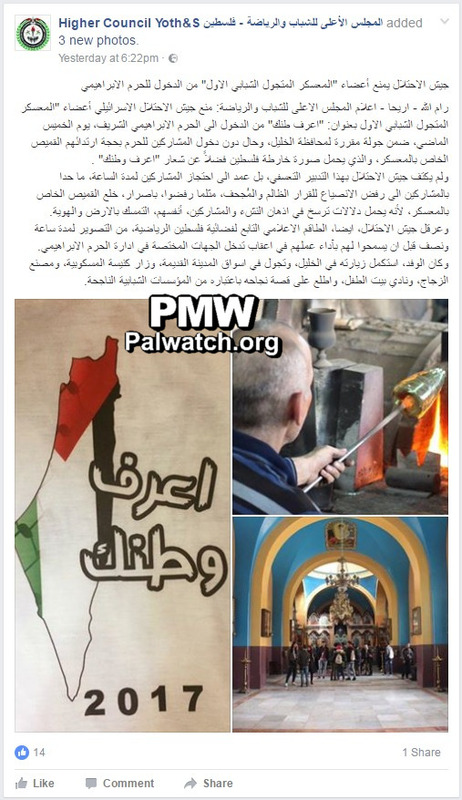 PMW has already reported on Rajoub's use of the map, but as this shows his practice continues. See additional examples below of Rajoub using the PA map. "This agreement must fulfill Palestinian national aspirations by including the following elements: the contiguous territory of sovereign, independent Palestine comprising the West Bank and Gaza, with East Jerusalem as its capital; the border based on the 1967 line with equal swaps; and the solution to the long suffering of stateless Palestinian refugees that is just and agreed." 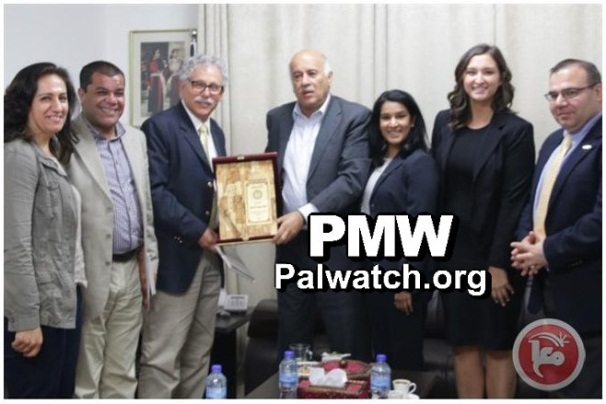 However, PMW has documented statements by PA leaders and broadcasts on PA TV explaining an ideology similar to Arafat's "stages plan," which sees a Palestinian state on the 1967 borders as only the first step in the process of taking over all of the State of Israel. The PA TV children's program The Best Home often teaches kids that "all of Palestine will return to us" and Palestinian leaders have described "Palestine" as stretching "from the Mediterranean Sea to the Jordan River." "The Palestinian leadership believes that a peace agreement, based on mutual recognition between Palestine and Israel, will mark the end of the conflict and finality of claims." 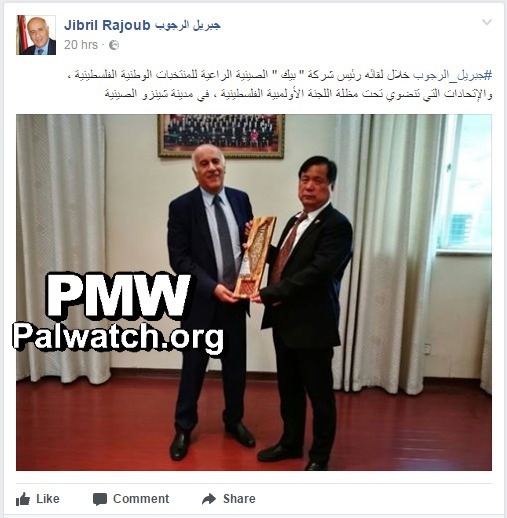 Rajoub talks about "mutual recognition," but PMW has exposed that Rajoub adamantly speaks against "normalization" with Israel. He has even stated that "any activity of normalization in sports with the Zionist enemy is a crime against humanity." Unfortunately, Rajoub's words in Newsweek far from reflect his own behavior in reality. Chairman of the Lebanese Football Association Hashem Haidar has also been given a plaque of honor featuring the PA map of "Palestine" by Rajoub. Jibril Rajoub holds the following positions: Secretary of the Fatah Central Committe, Head of the Supreme Council for Sport and Youth Affairs, Chairman of the Palestinian Football Association, Chairman of the Palestine Olympic Committee, and Chairman of the Palestinian Scout Association (PSA).